British Airways has confirmed 25 jobs are to be cut following a reduction in its CityFlyer service, based at London City Airport and Edinburgh. The airline said "surplus" cabin and flight crew positions had been created when one of its planes was written-off. In February the plane lost its front wheels landing at London City Airport on arrival from Amsterdam. The CityFlyer service from Edinburgh to London has been scaled back from eight to six return flights a day. A British Airways spokeswoman said staff had been informed of the cutbacks by letter and discussions with employee unions were ongoing. The airline hoped the reductions could be made through voluntary redundancies, retirement and converting full-time jobs to part-time, she said. She added that the Edinburgh-London route would remain well-served by services to Gatwick and Heathrow. 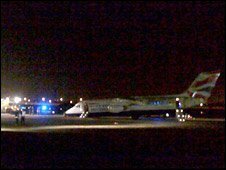 The BAE Systems-manufactured Avro RJ100 aircraft suffered a failure on landing in London. Its 67 passengers and four crew were evacuated using the emergency chutes and there were no serious injuries. The BA spokeswoman said: "The extent of the damage means the aircraft will be either written off by our insurance company, or the repairs will take so long to complete that this would coincide with the return of the aircraft at the end of its lease period. "This means our fleet at London City Airport will be reduced to 11 aircraft. "We will therefore be reducing frequency on our London City-Edinburgh service and as a result, regrettably, we will have to reduce our BA CityFlyer workforce by 25. "It is hoped to achieve this through voluntary means."